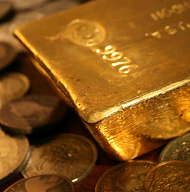 GOLD PRICES in the London wholesale market touched an 8-month high at $1310 per ounce Tuesday as European stock markets rallied and crude oil rose. 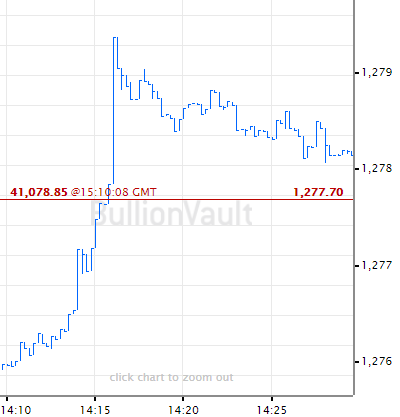 Gold priced in the so-called 'safe haven' Swiss Franc gold also rose to its highest since May 2018, gaining above CHF1300 per ounce, while gold prices for Eurozone investors set fresh 19-month highs above €1146. The UK gold price in Pounds per ounce held little changed however below £995 as Sterling extended its rally ahead of today's key Parliamentary vote on Prime Minister Theresa May's agreement with the European Union for 29 March's Brexit. With 1 week to go until Chinese New Year – now the world's peak gold buying festival, overtaking Diwali in India – gold prices in Shanghai's wholesale market rose within 1.0% of early January's spike to late-2016 levels against the Yuan. Latest data said Monday that gold imports via Hong Kong to mainland China fell in half between November and last month, totalling just 19 tonnes in December. But today the premium for gold delivered in Shanghai rather than global hub London rose to $14 per ounce. 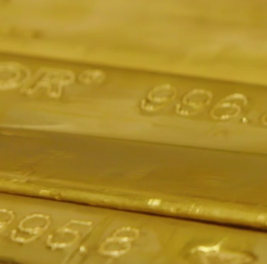 Some $5 above the typical incentive for new bullion imports into the No.1 consumer nation, that suggests solid demand. "After withstanding a test underneath $1300 in New York on Monday," says a trading note from Swiss refiners and finance group MKS Pamp, "bullion price action remained buoyant during Asian trade today. "Today we see Comex expiry [of the January gold futures contract] with around 5,500 lots of open interest at $1300, which is likely to keep price action around the figure. "The upcoming [US Fed] meeting should temper the breadth of the price range leading into Wednesday's scheduled press conference." Betting on US interest-rate futures now puts a 100% chance on the Federal Reserve holdings its key rate unchanged this week. Despite the partial shutdown of US government services ending last weekend, Wednesday's GDP report for 2018 will still be delayed as the Commerce Department's Bureau of Economic Analysis gets back to work. Friday's monthly jobs data from the Bureau for Labor Statistics will appear as usual. Back in London, and among other amendments to May's Brexit plan, lawmakers will vote on 2 key proposals – one calling for "alternative arrangements" to the contentious "Irish backstop", and another calling for the Government to delay leaving the EU if no deal is approved by 26 February. A third proposal aiming to unite the 'hard Brexit' and 'Remainer' wings of May's party – calling for a free-trade agreement using "as-yet-unknown technology" – was called "both extraordinarily funny and tragic" by EU officials and a "fantasy" by pro-Brexit Conservative newspaper The Telegraph. Shares in Russian aluminum producer Rusal (HKG: 0486) meantime extended their near-10% rally overnight, now erasing half of last April's 70% plunge as the US Treasury lifted sanctions against tycoon Oleg Deripaska despite Democrat lawmakers pushing to maintain them. That saw base metals venue the London Metal Exchange (LME) lift a temporary suspension on storing and trading Rusal-made bars. Washington meantime applied new sanctions to Venezuela's state-owned PDVSA oil company as part of its push against elected socialist president Nicolas Maduro – already blocked from repatriating gold bullion held for the Latin American nation at the Bank of England in London.